In the summer of 1959, most of the town of Braddock, Pennsylvania---along with half a million steel workers around the country---went on strike in the longest labor stoppage in American history. With no paychecks coming in, the families of Braddock looked to its football team for inspiration. 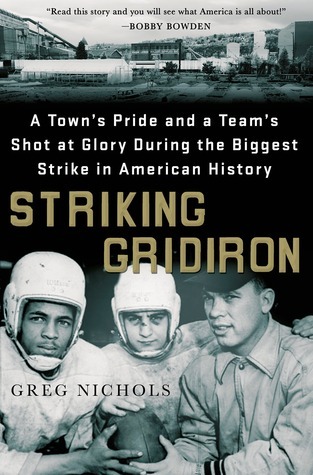 But even more than the story of a triumphant season, Nichols’s narrative is an intimate chronicle of small-town America during the hardest of times.Striking Gridiron takes us from the sidelines and stands on game day into the school hallways, onto the street corners, and into the very homes of Braddock to reveal a beleaguered blue-collar town from a bygone era---and the striking workers whose strength was mirrored by the football heroics of steel-town boys on Friday nights and Saturday afternoons. This book about a high school football team from the 50’s in Pennsylvania, Braddock Pennsylvania, to be exact. Opens with the last game of the 1958 season North Braddock High against Braddock High, Braddock won 9-6 and now along with the championship coach Klausing has another year to see if they can remain undefeated for six years. The story entwines his love of his family and how important they are to him, 5 children and his wife who at this time they have been married 15 years. The author takes you back to how they met and where her parents came from and his conversion to Catholicism. His father is a Methodist Preacher, being a winning coach did allow him at times to some perks like on Saturdays when they had a game when he went to confession everyone would make sure he went first so he would not be late. Thought that was funny. The author also brings in the story of a steel strike that is affecting the town with the plant being idle and most of the boy’s fathers working there the strike would go on for the season. He shows how they would go to a camp for a week or two before school starts to get conditioned for football and the new players to learn the plays, also bonds the team. In high school we called this hell week. Some of the stories brought me back to high school football and the coaches I had, and some of the yelling all to get you to play as a team. This is a wonderful story and though now the high school record is well over 150 games, this takes you back to a time when coaches would give players rides and look out for them because sometimes they did not have a father at home. Coach Klausing like many other coach’s wanted the best for those boys and that is what he got. A fantastic story of a time lost. A very good book. I got this book from net galley. I give this 5 Stars.